Not Half Bad: KNIGHT & DAY (2010). Not the Cole Porter song. Not the Kid Cudi song played backwards. Not a long-lost Ted Knight/ Doris Day buddy-cop comedy. Not a bad movie, either! At one point in the new big-budget romantic comedy Knight And Day, starring Tom Cruise and Cameron Diaz, one of the two leads turns to the other and, by way of reassurance, claims, “I’m pretty good at what I do.” It’s a line of dialogue that fits the story at hand, but also works to describe what’s effective about the movie and the people making it: It really could be either one of them speaking that line, since both of them are pretty good at what they do: Being huge, likable movie stars. 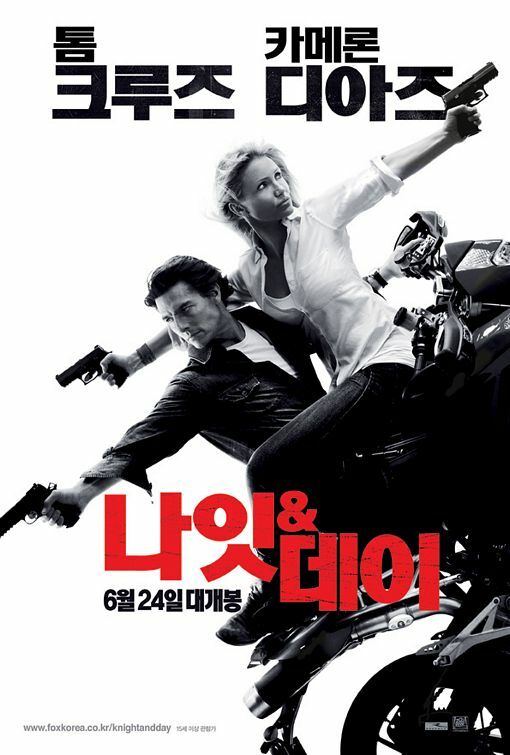 Knight And Day is a movie about a relatively normal girl, as far as these kinds of movies go – she’s a uniquely attractive single woman who works as an auto mechanic – who meets a guy she likes on a commercial airline flight. He turns out to be some kind of elite superspy who may or may not have gone AWOL, and is definitely being pursued by some pretty tough customers. Cameron Diaz plays the former and Tom Cruise plays the latter. Clearly – since it would have been a drastically different movie if the roles were reversed. That’s a joke, but the reality of the situation is that the roles originally were much different – here’s an article where I talked about the reporting by The New York Times on Knight And Day’s convoluted preproduction history. We’ll never know if Wichita would have been a great movie in its own right, but whoever had the idea to recast the story as a romantic comedy and whoever had the idea to approach Tom Cruise with it seem to have been proven right on their instincts: Knight And Day works. Well, the title still doesn’t. But at least the movie mostly does. They used to make movies like this all the time, or at least it feels like they did. Knight And Day evokes memories of classic movies like the Cary Grant/Audrey Hepburn spy romp Charade, while blending the better aspects of Tom Cruise’s Mission: Impossible movies with Cameron Diaz’s romantic comedies. The fact that here are two stars of the 1990s being more light and likable than they’ve been onscreen in quite a while also adds to the retro feel of the movie. A lot of the credit for what works about Knight And Day goes to James Mangold, a writer and director who, if reviews and internet journalism is to be believed, is a journeyman rather than an auteur, but I disagree. Mangold isn’t an auteur the way that Scorsese or Mann or Spielberg are; he doesn’t seem to have themes that obsess him and that he returns to in his movies time after time. But he seems to have a curious creative spirit, and like such classic-era directors as Howard Hawks, seems to be comfortable working in multiple genres. Particularly in his last run of films, Mangold has been reliable for quality: Walk The Line, 3:10 To Yuma, and now this? That’s a pretty solid run right there. The one constant I notice in Mangold’s work is the ability to bring out the best in well-known actors, and he had his work cut out for him this time around. Tom Cruise has been tough to defend over the past several years – he’s obviously a tremendous actor and for many years, one of the canniest choosers of projects of all modern stars. Then the Scientology association came to the fore and most people got turned off. As for Cameron D, well, for me the Timberlake association is even more dubious than an L. Ron Hubbard association, and I’ve seen plenty of gossip rags and dumb blogs sniping at her looks lately. I’ve always liked Cameron onscreen, and if you’re one of those guys who doesn’t think she’s pretty, I think it’s possible that you might not actually like girls. Still, if you’re James Mangold, you’d have to address the notion that there’s a bit of a PR problem to overcome with this tandem. It all worked out. Cameron is more lively and luminous than I’ve seen her maybe since There’s Something About Mary, and as for Tom Cruise, well that’s the smartest of all the work done here. Knight And Day is a story told through the eyes of Cameron’s character. In the movie’s most unique and pleasurable moments, we see Cruise’s character show up from her perspective. We hear his footsteps on the roof of the bus she’s riding; we see a shadow drop from the roof to the ground; we get an obstructed view of him as he works his way through the crowd. He’s always got this fixed grin on his face. We don’t totally trust him. We want to. We want to believe he’s still that guy, but we can’t totally trust it. Knight And Day quietly, surely, smartly works with the offscreen expectations of the audience and makes it work towards the benefit of the story onscreen. It makes us relate to the more relatable star, and makes us slowly and steadily warm up to her onscreen love interest. This is a must-see for film students and prospective directors who are interested in the idea of persona. For the rest of us who don’t care about such things and just want to know if this is a good time at the movies, my answer is yes!, somewhat surprisingly. I had no strong expectations of Knight And Day outside of an appreciation for the director, and my faith in TC had dwindled to dangerous depths. I was pleasantly surprised with what turned out to be a pretty fun, breezy summer movie. Sure, it’s a little callous about collateral damage and death, but who cares? It’s a Hollywood ride. There’s some real solid, economical screenwriting on display here, and some fun, original chase scenes (the running of the bulls scene being a particular favorite – I love it when angry animals get wrapped up in chase scenes.) I regret to inform you that the movie ends on a song by The Black-Eyed Peas, but other than that, I actually find myself recommending this movie! As a world-travelling spy flick, it’s funnier and more clever than most, and as a date movie, it’s a no-brainer. Movie Review: GROWN UPS (2010).